Who knew that a documentary on the food stamp program could be funny, infuriating, informative, and entertaining? 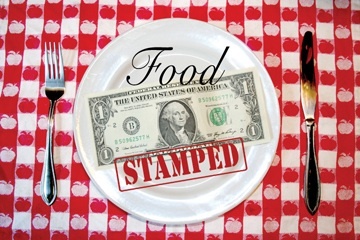 Food Stamped sets out to answer a simple but important question: Is it possible to eat well for a week on the federal supplemental food aid program? As well as detailing their experiment, the film weaves in footage of Chef Shira serving up healthy greens in cooking class to eager elementary school children from mostly poor families; these same kids get hideously unhealthy and unappetizing options come time for school lunch. And nutrition experts weigh in on how hard it is for low-income Americans to put three-square meals on the table. Let’s face it: Money and time is tight and fast food is cheap. Why not load up the shopping cart, as one food stamp recipient does, with pallets of Top Ramen noodle packets? But as we learn, the price is right — for all the wrong reasons. Junk food cranked out by industrial food producers costs less because of government subsidies for big agriculture that small organic farmers simply don’t get. The film is full of food stamp facts: One in eight families is eligible for such assistance, though only one out of 15 participate in the program. And 40 percent of those families are white, in case you’re wondering. By all accounts California does a bad job reaching folks who could really use food stamps and critically underserves the Latino community — the required fingerprinting is a huge deterrent to immigrants, according to a post-screening panel discussion, though food justice activists are all over that one. But does it even matter if people who need food stamps aren’t getting them if it’s impossible to eat healthily on assistance? Or, put another way: How did the documentary duo do on a food-stamp diet of about 50 bucks a week? Spoiler alert: The Potashes were well fed — but only because they live in bountiful Berkeley and poured their combined knowledge, skills, time, and energy into the exercise. Still, they came up short in calories and some nutrients despite their best efforts. And, truth be told, things got a little testy on the domestic scene as the week wore on and the rationing of staples like carrots and peanut butter proved necessary. As for meat, snacks, or desserts? They simply went without. If you’ve worked up an appetite to check out this family-friendly film and you live in the Bay Area, take the kids (you may want to feed them first) to a screening next Sunday June 28 at 7 pm at the JCC East Bay Theater in North Berkeley. If you live elsewhere, then look for this excellent educational offering coming soon, I’m almost certain of it, to a PBS station near you. This entry was posted on June 22, 2009 at 12:27 AM and is filed under food in films, food politics, school food. You can follow any responses to this entry through the RSS 2.0 feed. You can leave a response, or trackback from your own site. Thanks so much for this tip! This is exactly the kind of documentary I like watching. Nice to have your eyes on the look out….